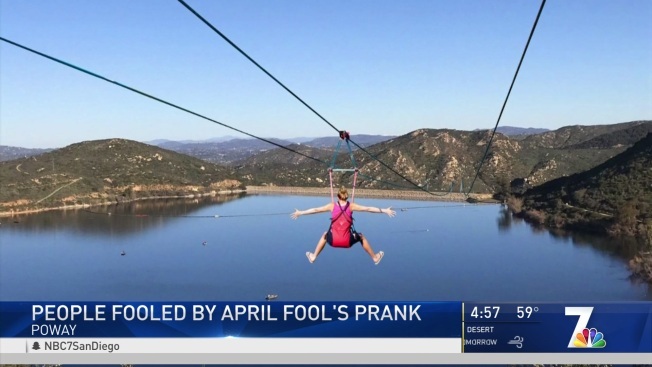 An April Fools’ Day joke posted on social media by the mayor of Poway claiming a zip line had been installed at a local lake really took some people for a ride. Vaus’ post linked out to a web page, where a fake press release awaited, detailing the city’s alleged new attraction. On Tuesday, Vaus posted again to his Facebook page to tell people the zip line post had been nothing more than an April Fools’ joke. The last part of the mayor’s message referenced another landmark in Poway, another joke about that landmark’s condition, and another nod to April Fools’ Day. On Wednesday, the City of Poway posted a message to its Facebook page also confirming the zip line did not exist and had been nothing more than a prank by the city’s “fun-loving” mayor, who loves himself a good April Fools’ Day joke. The post said staffers at Lake Poway had been “fielding quite a number of calls and visits by adventure enthusiasts” looking to ride the zip line. In fact, so many people wondered about the fake attraction that the City of Poway had to post a sign at Lake Poway telling people they had been pranked. Those who follow Vaus on Facebook commented on his posts throughout the week, with many saying the prank had made them laugh. Others also said he should really consider adding a zip line to Lake Poway.